I had signed up for Google Reader 6 months ago, but didn't really enjoy the experience. The Reader then had User Interface which I felt wasn't friendly, the navigation & managment of feeds wasn't easy, finally the reader provided only a list view of your favorite subscriptions & u only got a snapshot, if u clicked on a particular item. Gradually overtime I had stopped using it, untill last-week when I read the post 'Google Reader gets a facelift' by Garett Rogers on ZDNet's blog 'Googling Google'. 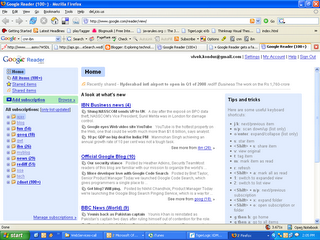 I logged into my Google Reader today morning to get a feel of the new features. 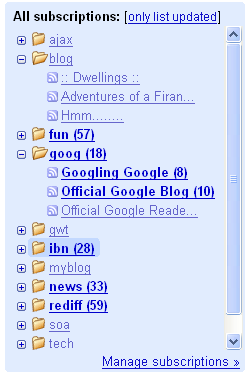 The first thing which stood out was the clean and simple view of Google Reader Home. On your left-hand-side it has shortcuts to your home, starred items, shared items and finally to all your subrscriptions. 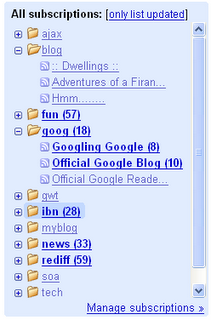 Then I noticed, that all the tags which I had used to label my favorite feeds where transformed to a folder view. All the feeds are neatly classified under each folder. I liked this idea of folder-based navigation, keeps it is simple & easy to manage all the feeds. The next feature, is the different viewing styles available as of now are Expanded View and List View. Both of them are very useful for me, I use the Expanded View, to browse the feeds of my fellow bloggers & I use the List View to have a glance @ all the news feeds - Rediff, ESPN, CNN_IBN, ZDNet, etc. Finally, the Reader has borrowed few features from sister services (GMail, Blogger and GCal) like adding stars, tagging, sharing, emailing. Has much better implementation of Read-state management. I am a guy who loves reading & on any given day I spend atleast 2 hours reading save them on del.icio.us & sometimes I share them across with my friends based on our common subjects of interest. The sharing was a painful process, everytime I read something interesting & felt like sharing it, I used to IM (Instant Message) them those links. Google Reader reduces this hassle of sharing, as it provides me to share my Reader feed with the rest of the world on my website. Click here to view what I have shared for you. With all the new features and enhancements, I feel I would use Google Reader more often. Another good reason for one to use Google Reader is to read blogs/sites when there are restrictions enforced by your government or your employer. If you aren't using it, then I suggest you to give 'Google Reader' a shot. 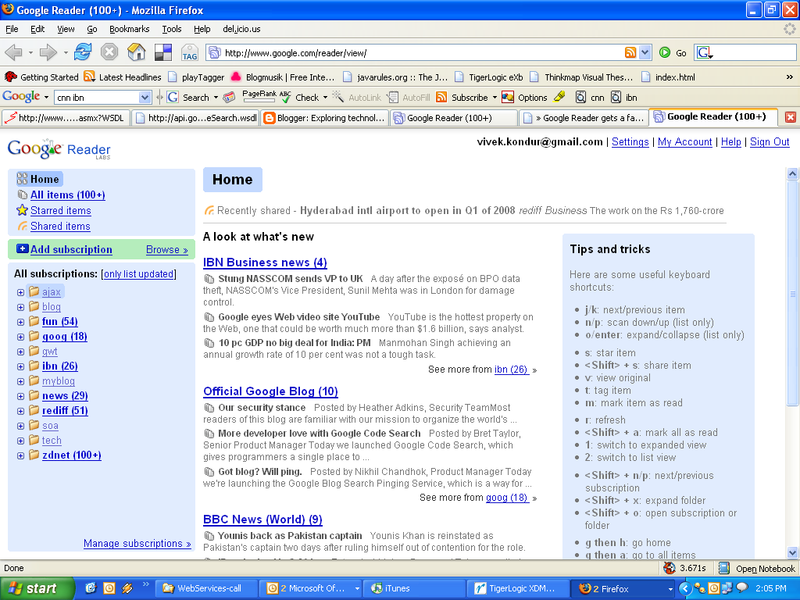 The problem with GoogleReader and may be BlogLines too is that it takes them ages to lead the feeds in there. It seems that they start grabbing the new feeds only when you click on a link there and that's what makes them slow.